As one of the many bands I’ve seen support The Virginmarys over the years but only one of the few to be good (and no sign of the latter list growing anytime soon), I’ve since kept an eye on Naked Six’s continuing adventures, having seen them since and watch on social media as they constantly gig up and down the country. Whilst in a live environment, they gave off the vibe of The Graveltones having done enough speed to make Lemmy wince, debut EP No Compromise portrays a much more complex sound without becoming turgid. 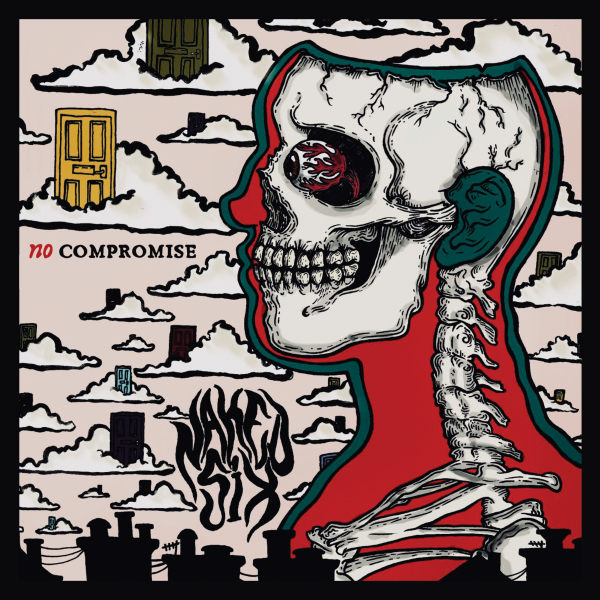 Title (and opening) track “No Compromise” brings the fuzz of The Black Keys to the table alongside the brashness and in-your-face mentality of punk as vocalist/guitarist, Seb Byford, takes aim at the assholes the universe spits out. It’s a sound which resurfaces on “Tear Away” and “Unwind” whilst “Let it Out” and “Who Am I to You” brings the tempo down and focus more on the Yorkshire mob’s bluesy moments. It shows they can handle both sides of the coin just as proficiently with “Let it Out” being the strongest song of the EP with Byford’s grizzled and throaty drawl pinning itself perfectly against the meaty groove. It’s revisited on “Who Am I to You”, laden with angst and venom, the parting shot of the EP is filled with grooves and aggression to finish matters on a high. Elsewhere, “Unwind” finds Tom Witts smashing his drums to pieces as they batter Byford’s grungy guitar tones. It’s the perfect bridge between the two more subdued songs on the EP and will have you tapping your feet before you even realise it. Whilst the EP was recorded as a two-piece of Byford and Tom Witts, Callum Witts’ addition on bass duties will see them become a three-piece in a live environment. It’ll add so much more depth to their performances and allow them to recreate what’s on this EP far more faithfully to give even beefier and thrilling live performances than they already have as a twosome.